Earlier in the week we had written about a Mankato West senior who was competing for National History Week honors for her video documentary about the Holocaust. The Rochester Post Bulletin now reports Teens win award for 'Doors2Cambodian' Web site. 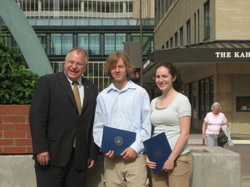 (Rochester, MN)- Yesterday, Congressman Tim Walz congratulated Rochester residents Meghan Lockhart, Naomi Wente and Jordan Wente on taking the top honors in the international competition, "Doors to Diplomacy." The contest, sponsored by the US State Department and Global SchoolNet, recognizes websites that best teach young people about the importance of international affairs and diplomacy. "These three students had a life changing experience by traveling with a service learning class to Cambodia. Nothing makes me more optimistic about our future than students who show such strong interest in the world around them," said Walz, who presented the groups with congressional certificates recognizing their outstanding achievements. "Through this project, these students became global advocates for human dignity. Their success is a great testament to the youth in Southern Minnesota and we should all be proud of Meghan, Naomi and Jordan." The team from Rochester built upon a recent RCTC class trip that promoted citizen diplomacy. Following their trip, the group developed sustainable service projects including "One Toilet at a Time" and "Project Chalkboard." Details on these projects can be found at the group's web site. Text of the US State Department's announcement can be found here. This year, more than 190 students from 38 countries participated in the "Doors to Diplomacy" competition. Each student winner received a $2,000 scholarship. In addition, the winning coach, Lori Halverson-Wente received a $500 cash award. Thanks for this great post. Sounds like the team from Rochester is on the right track. I just finished reading the book "Meeting the Enemy, Becoming a Friend" by Dr. Melinda Gelder which discusses her citizen diplomacy actions in Japan between the U.S. military and Japenese citizens. This is a great read to see how every person can engage in a little citizen diplomacy. Are there other examples of real world citizen diplomacy that I can find?